We’d love your help. Let us know what’s wrong with this preview of The Colonial Iron Horse by Arturo G. Corpuz. To ask other readers questions about The Colonial Iron Horse, please sign up. I picked up this copy at this year's Manila International Book Fair, and was immediately sold upon reading that this is a history of the (seemingly defunct) railroad system in the Philippines. 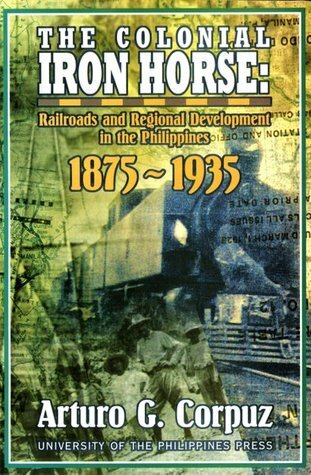 The "Iron Horse" that was the Manila Railroad Company was at its height during the pre-war years. While the title may seem a bit mechanical and cold, for the history buffs, the content delves into the rich history of transportation scheme that was an offshoot of the mighty trail of the Pasig River. The amou I picked up this copy at this year's Manila International Book Fair, and was immediately sold upon reading that this is a history of the (seemingly defunct) railroad system in the Philippines. The "Iron Horse" that was the Manila Railroad Company was at its height during the pre-war years. While the title may seem a bit mechanical and cold, for the history buffs, the content delves into the rich history of transportation scheme that was an offshoot of the mighty trail of the Pasig River. The amount of research about this partially-neglected part of Philippine history is commendable and the historical mapping of the the previously-existing lines in relation to the current names of these places, are described succintly. the On another note, the maps--on the existing and proposed lines were quite disheartening to read through because had these railways continue to run, the amount of traffic in the urban setting may not be as extensive at it is today and inter-provincial and perhaps even inter-island travel could have improved by leaps and bounds.